October is a fun month at Walt Disney World. 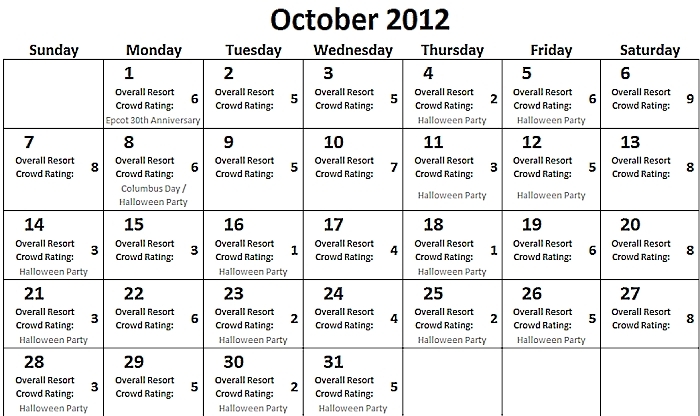 Here’s a quick view of Walt Disney World’s October 2012 Crowd Calendar which, if you look today, you can see for free, without charge, sans-subscription (well, you get it)! October 1, 2012 marks 30 years since Epcot (then EPCOT Center) officially opened to the public. As of this writing there has been no major celebration announced, but you may still want to avoid Epcot due to the possibility of large crowds celebrating the anniversary. October 4, 2012: As you would expect, October has several Mickey’s Not So Scary Halloween Parties at the Magic Kingdom. Other October dates are October 5, 8, 11, 12, 14, 16, 18, 21, 23, 25, 26, 28, 30, and October 31, Halloween. Advance-purchased tickets cost $56 for adults and $51 for children ages 3-9, plus tax. Same-day tickets are $63 and $58, plus tax (purchase Mickey’s Not So Scary Halloween Party tickets here). The Magic Kingdom closes at 7 pm these nights, which has its good and bad points. The bad is obviously that you have less touring time. The good is that many people stay away due to the shortened park hours. Since many do avoid the park on those days, we expect the Magic Kingdom to have very low crowds on all of the party days. October 8, 2012 (Columbus Day): Like many holidays, Columbus Day will bring in some extra people. The entire weekend will have higher crowds, so sticking to a Touring Plan is highly recommended. Weekends at Epcot: Epcot’s annual International Food & Wine Festival continues through October and into November. This is becoming an extremely popular event. World Showcase‘s walkways can get choked with people on Fridays, Saturdays, and (to a lesser extent) Sundays as the tourists and locals converge. While the wait times for the Future World attractions do not climb as much as might be expected, the crowds at the food kiosks and the roaming groups of drunk college kids can make walking through World Showcase unpleasant. We recommend avoiding Epcot on Fridays and Saturdays during Food & Wine unless there is no other option. Extra Magic Hour Days: October is considered a “shoulder” month, meaning that it is not busy like the summer but not as quiet as September either. This makes the Crowd Calendar a little more variable. One of the major contributing factors to crowd flow is Extra Magic Hours. Throughout the entire month you will notice higher ratings at the park with Extra Magic Hours. 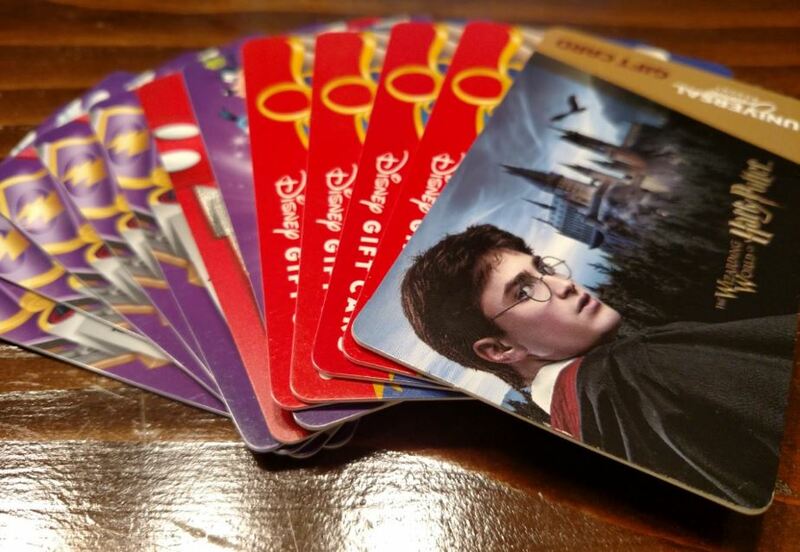 Here at TouringPlans.com, we are big fans of Extra Magic Hours, but only if you can make full use of them by arriving early or staying late. If you cannot, we recommend you choose a different park or at least switch to a non-Extra Magic Hour park during the busy part of the day. It is an odd social experiment, but it seems that many people will visit the park with Extra Magic Hours regardless of whether they are there during the extra time. Crowds are rated on a scale from 1 to 10, with 10 indicating the highest crowds. The crowd rating is based on attraction wait times, not the number of people in any given park. Ratings are generally comparable with previous years, so if you visited Disney World in 2010 on an “8” day you can expect an “8” day in 2012 to be similarly crowded. Ratings are not comparable from park to park. A “6” at the Magic Kingdom is not necessarily comparable to a “6” at the Animal Kingdom. Why? The Animal Kingdom has fewer rides and shows than the Magic Kingdom, handling different numbers of people per hour. The number of people that make the Magic Kingdom a ‘6’ would overwhelm the Animal Kingdom’s rides. Some rides, such as Soarin’ and Peter Pan’s Flight will still have a wait of around 60 and 30 minutes respectively, even on the crowd calendar’s “1”-rated days. A “1” simply means that it is one of the least busy days, relative to all other days. If you are fortunate enough to be traveling on a day with low crowds…enjoy! If you find yourself going on a day that has a higher crowd rating…you have no worries either! Why, you ask? As a TouringPlans.com subscriber you have access to thousands of Touring Plans (which are now optimizable) and our Lines mobile application which will guide you through the parks and keep you from waiting in long lines. Arriving at park opening and following a Touring Plan is the best way to totally negate the crowds. Hopefully this shed some light on our Crowd Calendar ratings. Feel free to ask questions! Do you do this for Disneyland ? Unfortunately we do not as of right now. Sorry. What no Touring Plan Meets this month? I am hoping for one before the 9th. I’m not sure if we have one scheduled for October yet, but that does not mean that there won’t be one. We will let you know if any meet comes together. Saturdays are really busy….does this take into account locals? Yes it does. We take into account everything that impacts attraction wait times. October is a great month weather-wise in my opinion. The special events offer lots of fun as well as some additional crowds, but in my experience its not too crowded to enjoy. Looking forward to Oct 2012! We will be there the 3rd week in October. On Sunday 10/14, we are thinking about MK in the daytime, and then park hopping (due to the early close), over to Epcot for Food & Wine around 5 pm. We are hoping the local crowds will have cleared out by that time, any thoughts? Sundays at Food & Wine are not as bad as Fridays and Saturdays, although they can be busy. By 5 there will still be some people hanging around for dinner, but you will avoid most of the heavy drinkers on a Sunday evening which makes the crowd a lot more subdued. Do you know what crowd levels will be like for MNSSHP? More specifically 10/8? We could choose 10/5 also but thought Mon. Crowd levels would be better than a Fri. What are the chances it sells out early? Thanks!